Andrew Smith is back for another riveting instalment of Spilt Milk Studios: The Hard Lines Saga! Back on the 9th June 2011 Hard Lines came out. 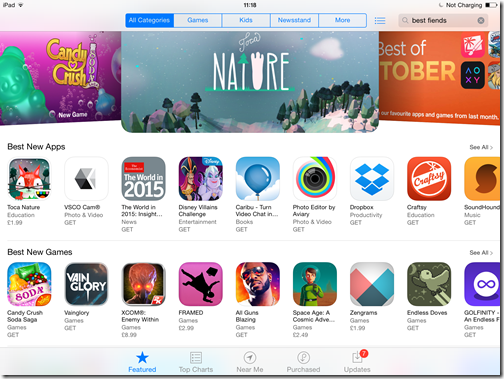 Apple featured us in the New & Noteworthy section for 3 weeks. The game was very warmly received by critics and public (except when we released two crash-y updates) and we’ve seen a moderate amount of success over the intervening weeks. Since last week we’ve seen a couple of large events, but first a smaller one. We actually saw a big (for us) sales spike of 30 after the UK’s national paper The Telegraph reviewed us very warmly. That’s all really, just thought it was worth mentioning seeing as I’ve been going on about the small returns that this kind of nation-wide coverage seems to get our humble iPhone game. So the last thing we’ve done to the game is release IAP of our ‘iPad Extreme HD Mode’, which is essentially our answer to Angry Birds HD. Except that our HD update does more than change the graphics, it gives you more room to play the game’s 6 modes in, which thereby had to be rebalanced, and subsequently offers pretty different gameplay. So far, we’ve seen a rough correlation to the overall sales of the game – where the iPhone game sales rise, so do the IAP numbers. The image below should illustrate that – blue for iPhone and red for iPad – though do note that the iPhone sales are in the tens of thousands, as oppose to the mere tens, so the charts are not proportionate on the y-axis. Numbers-wise it’s done very little (or to put it another way, roughly matched our pre-FAAD daily sales rate for iPhone) and I believe that may be down to a couple of reasons. It took me 35 or so words to describe what the HD mode does, and that can’t be helping customers who are sat on the fence. Also, people are used to having a simply-labelled ‘HD’ version of the same game on the marketplace, and so perhaps naming it (the infinitely more fun and engaging-sounding) iPAD EXTREME HD MODE wasn’t the best decision. So moving on to the big news, and the more stat-friendly section, Hard Lines was featured as FAAD’s Free App of the Day on Monday the 15th of August, and so far (2 days in) we’ve seen huge amounts of downloads. On Sunday (it was made free at about 2pm GMT on Sunday) we got just shy of 10,000 downloads. Almost as much as the birthday promotion we did a few weeks back. Monday saw the numbers skyrocket to a pretty exciting figure, with over 80,000 people downloading it. This goes to show the kind of reach that the FAAD organisation has, over and above the efforts that a single developer can hope to have. Tuesday saw the number dip down slightly, to just short of 60,000 downloads. I’m assuming this is natural, but the game will stay free for the week so the really interesting part will be in the next diary where we see how it fares over the 5 days, and then what happens when we switch back to paid. Suffice to say that right now we’re riding pretty high in the free app charts. On iPad we’ve hit the top 75 for Apps, 27 in games, 6 for Action. On iPhone we’ve managed to rise to 52 for Apps, 31 in Games and 11 in Action – all in the USA, which is the biggest and most important market. I’m hugely pleased with that result, and I’m hopeful it continues. We’ve of course managed to get plenty more user reviews as a result (and some more fan mail too) so the success is hopefully making us more likely to continue on at a good rate in the future. So how do we plan on taking advantage of all this? Well I mentioned last time that we’ve got some interesting plans for Hard Lines, and I’ll divulge a few here now. The first is that we plan to introduce an in-game currency (which of course simply MUST be entitled Hard Cash) so that players can both earn through playing, and buy with IAP to access the extra modes we’re going to be shipping. If I’m completely honest all of this would have been done weeks and weeks ago if we were able to work on Hard Lines full time, but we’re doing our best with what we’ve got. So anyway Hard Cash will be the foundation on which our expansions are built. We’ve got plans for 4 new modes to sell through the game, plus a free one which I’ll detail below. It’s worth saying that we’re going to offer the ‘iPAD EXTREME HD MODE’ versions of all of them for free to anyone who owns the iPad-specific toggle. It just adds value for everyone, and is hopefully seen as a fairly generous move on our part. Also, it should make the code a touch simpler! The free mode we’re going to update the game with is tentatively called Daily Challenge. It’ll offer a Hard Cash bonus to anyone who can complete the auto-generated challenge of the day. It’ll pick from any available mode and set the player a challenge, and not only do you earn extra Hard Cash you’ll get an extra notch on your belt, represented by the leaderboard for this mode – it’ll track your total, and really encourage you to play the game a little bit every day. Or that’s the plan! Not only that, the mode will allow players to sample modes they haven’t yet purchased and we think this will be a really good method to ‘demo’ new modes to potential customers. Time will tell, but it’s pretty unique to Hard Lines and because it’s free to everyone we’re expecting to see some really good market penetration on conversion rates. So it’s been a peculiar couple of weeks. Writing this slightly early (I’m off up to Edinburgh on Thursday for a long weekend’s break, you’re likely reading this on Friday, and it’s being written on Wednesday!) means a really good look at the benefits of the FAAD offer are being saved for next time. That said I think it’s clear that going free is a smart move, if you’ve got the game plan to take advantage of it. Ideally we’d have had more IAP to sell at this stage, but I’m hopeful that a large percentage of these players will not be one-offs and will still be active by our next update.